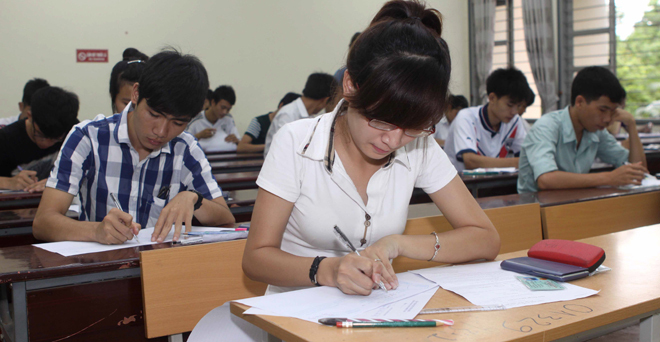 HA NOI (VNS) — More than 120,000 students will sit for the national high school exam this year in Ha Noi. The students will be from Ha Noi, and other northern provinces such as Nam Dinh, Ha Nam, Vinh Phuc and Hoa Binh, besides Bac Ninh. There will be about 80,000 students from Ha Noi, comprising 66.4 per cent of the total, while 15,407 will come from Nam Dinh, 8,500 from Bac Ninh, 6,000 each from Ha Nam and Vinh Phuc, and 4,500 from Hoa Binh. The students will be divided into nine groups, with eight being under the supervision of universities that will allow the qualified students to go to universities and colleges based on their high school exam results and their own entrance exams. The last group, with 9,685 students, will be under the supervision of the Ha Noi Department of Education and Training, which will determine which universities and colleges the students will attend, based only on their high school exam results.